Walk around the yard- this is the best way to start. Evaluate what work needs done such as bushes to trim, weeds to pull, grass to be edged. Also check fences, walls, gates etc for any damage done by winter weather. Give your gardening tools a check up- check your shovels, trowels, rakes and hoes to be sure all are in working order. It may also be a good time to send your mower or blower off to the service center before the mowing season starts. Trim trees, bushes- remove any dead, woody or overgrown areas of trees and bushes. Be cautious, hire a professional if the areas that need trimmed are out of reach or even out of your league. Prepare new beds- thinking of adding another flower garden or growing your own fresh fruits or vegetables? Now is a good time to layout your bed design and start to prepare the bed. Bird Baths and Feeder- these may need some TLC if they were left out in the winter. Take the time to clean and inspect your bird baths and feeders. Start a compost pile or bin- this is a great and cost effective way to get fresh nutrients to your soil by using things like grass clippings from your own yard. Remember, you don’t need to be a professional to enjoy a beautiful garden. 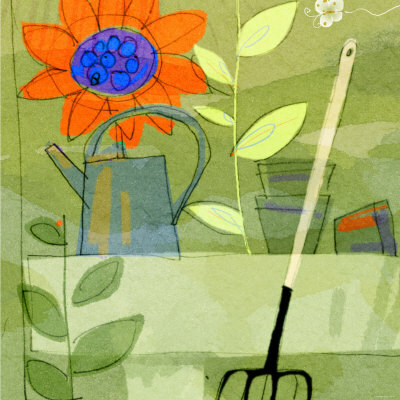 A green thumb may not come easily to everyone, but the benefits of just being outside and digging in the dirt far outweigh the benefits of sitting inside and thinking about the possibility of gardening. Get outside & soak up some sunshine, it’s good for your health!